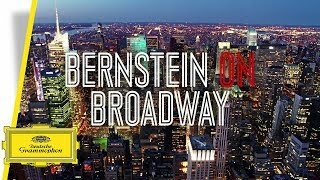 It is instructive to hear the detailing Bernstein gives to his own theater music, a reminder of what a uniquely singular compositional voice was to the American musical theater . . . Bernstein's concert hall staple Symphonic Suite from "West Side Story" never loses its intoxicating appeal for musicians or audiences . . . ["New York, New York"]: David Garrison, Thomas Hampson and Kurt Ollman have the vocal swagger to make it their own. Tyne Daly, sounding Merman-snarky in the "Taxi number", makes the most of Bernstein's Tin-Pan Alley blues vamp. Hampson's lilting bass is charming enough in Bernstein's filler number "Lucky To Be Me" with the chorus floating around like decorous holdouts from the Ziegfeld Follies . . . Will Bernstein's "Candide" ever get its full due praise? This brilliant modern operetta is way ahead of its time, and it only played on Broadway for two months. Of course, it is hard to beat the original cast headed up by the breakthrough performance of Barbara Cook, but with Bernstein conducting the London Symphony Orchestra (LSO) and Chorus along with soprano June Anderson and tenor Jerry Hadley, it is, in fact, just as magical. The sharpness and thrust of Bernstein conducting Bernstein ignites the LSO which blazes from the first notes of the "Overture¿, bringing forth majesty and buffa dimensions à la Offenbach. From the vocal minuet, "Life is Happy", to the Italianate classical charm of "Oh, Happy We", Hadley and Anderson have shimmering vocal charm. Anderson's sparkling soprano is so right for "Glitter and Be Gay", the buffa seria that slides into a sultry rumba and boils over into the fireworks of trills and orchestral gallops. And during "Make Our Garden Grow" Bernstein's lush symphonic bursts forth with a hope for humanity that is in the same musical theater class as "Somewhere." Deutsche Grammophon presents the ultimate collection of Leonard Bernstein’s most popular and best-loved melodies from West Side Story, Candide & On The Town - masterpieces at the zenith of this extraordinary composer's creative canon.